Right off the top, the price of the watch is way out of my price range. The ongoing Baselworld 2015 has caught our attention with the unveiling of outstanding and dazzling time-telling devices. Catching up with the rage of unique and limited edition watches, Hublot has also made their move by announcing three new Big Bang models. Hublot is commemorating Big Bang’s 10th anniversary at the world’s largest and most important annual watch exhibition by unveiling the Big Bang 10 Years Haute Joaillerie watches priced at $1 million each. 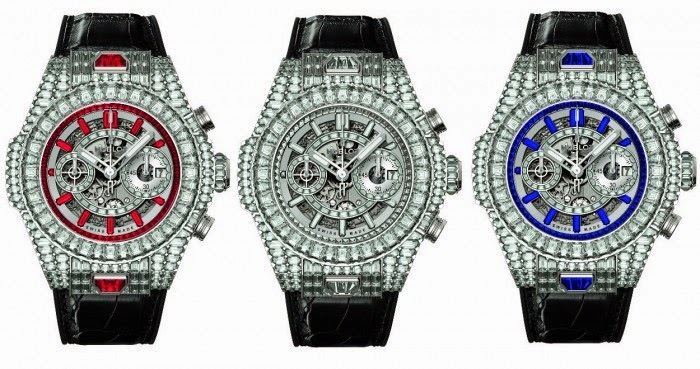 In spring 2005, Jean-Claude Biver, President of Hublot and President of the Watch Division of LVMH, along with his team, led by Ricardo Guadalupe, the brand’s CEO, debuted Big Bang. This was followed by a decade of phenomenal success. Of the three models, the dazzling haute joaillerie watch collection has made time stand still. Featuring unique and fundamental Hublot elements, the Big Bang “10 Years” Haute Joaillerie collection includes ten watches and is collectively valued at $10 million. Three of the most complex setting techniques like invisible setting, Clou de Paris setting and rail setting have been used to ignite the collection’s shimmering glory. While the full black diamond edition stuns with 653 black baguette diamonds totalling 41.84 cts, the white diamond version is bejeweled with 653 baguette diamonds totalling 40.02 cts. The same number of baguette diamonds and blue baguette sapphires totalling 40.41 cts dress up the blue sapphire version and the ruby edition is also decked with 653 baguette diamonds and baguette rubies totalling 40.93 cts. Also its the first time Hublot has expertly set the bezel with invisible inverted trapeziums. In another first, the counter surrounds on the dial are also stone-set. The complete dial, including the stone-set indices, comprises 62 baguettes. The details of the 653 baguettes on each timepiece goes like this – a total of 132 baguettes with invisible setting, 127 set on a rail and 394 with a Clou de Paris setting. Each piece of the Big Bang 10 Years Haute Joaillerie collection can be strapped on by a black alligator strap.